Once you have a baby it is so difficult to keep giving your pet the same amount of attention. You don’t try to forget about your pet, but you are busy and there are so many new tasks and activities once a baby comes home. I’m giving you 3 ways to keep showing your dog some love. Involve them in activities. If you are going on a family walk or stroller ride, bring the dog along too. Make an effort to give them attention while the baby is awake so that they don’t think they only get love when the baby isn’t around. 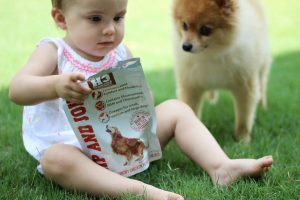 Help your baby and dog build a loving bond. We have always given Izzy and Teddy opportunities to interact together and taught her how to pet the dog. As an infant we would prop her up near him so she could feel his fur. Now she likes to help us hold the leash and care for Teddy. She really enjoys giving Teddy his treats and Teddy loves his treats. This daily routine has provided them with one more positive experience together. We use H3 Essentials treats for Teddy. The treats have hip and joint care so we are able to keep him strong, healthy and happy. They are full of Glucosamine, Chondroitin and MSM and best of all they are made in the USA! Teddy has had some knee issues and being he is a small dog this is common. When Teddy was a puppy he actually needed surgery on one of his knees so we try our best to keep his body strong. 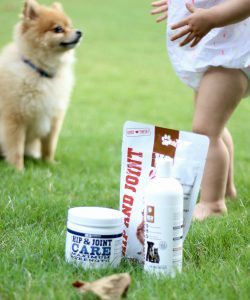 Check out the amazing doggy vitamins, shampoo, probiotics and more here. The oatmeal shampoo we get him is soap free so it helps to keep his skin from drying out & it is also made in the USA! 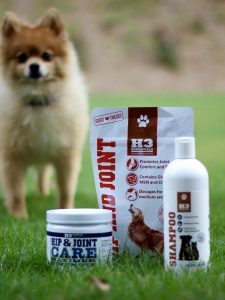 Go check out these products, it’s important to love on your pets too. Aww can’t forget about our first borns!!! Right? It happens so often, but we gotta love on our fur babes! I’m obsessed with our two dogs, and obviously my child, so you know I love this post! I’m sooooo glad to see another parent letting their child take part in treat time. People think I’m crazy when I let our little one give our dogs treats. Way to go! Can’t forget about those fur babies! Great tips! Eryka this is SUCH a great post!! I know so many people who are insanely guilt ridden because without meaning to they push their little furry loves to the side!! Great ideas. I kind of want to write one for my parents for “how to keep showing your children love after they leave the nest and you get a new puppy” ? No mom. The dogs are not my new brothers ? Aww, yes we tend to forget about our fur babies… not on purpose, but you know, it just happens! It totally happens, we get so busy with the human babes! We treated our cat like a child…until Tera came along. Lol. Now, he is a little more neglected, but still greatly loved and massively fat! And it’s so sweet to see the bond that Tera and Moose are forming! I struggled with this so much and wish I had read this before I had my daughter! Great tips!